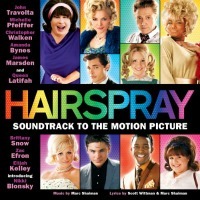 Film Soundtrack, 2007 (New Line Records) (4 / 5) A reasonably faithful and exuberant film version of Hairspray was released in 2007, and this soundtrack album captures a lot of the fun. Nikki Blonsky is a perfectly capable Tracy, if not quite as special as Marissa Jaret Winokur, and a starry supporting cast — Zac Efron, Queen Latifah, Christopher Walken, Michelle Pfeiffer, James Marsden — seems to be having a great time. The one unfortunate performance is the precious, consonant-chewing Edna of John Travolta, who reminds me, for some reason, of Carol Channing. 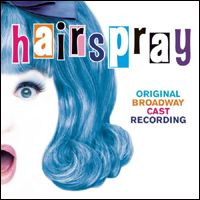 There are a couple of bonus tracks, including a valuable “Mama, I’m a Big Girl Now” (sadly cut from the film) sung by three Tracys: Winokur, Blonsky, and Ricki Lake (who played the part in the John Waters movie). The big-Hollywood orchestrations are enjoyable, but unlike Harold Wheeler’s originals, they don’t sound like they were lifted right off a Phil Spector 45. — M.M. 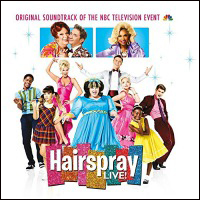 Television Cast, 2016 (Masterworks Broadway) (3 / 5) NBC-TV gave Hairspray a deluxe live presentation in 2016 — just after the Presidential election, at a time when its target audience needed its message of tolerance and inclusion the most. A studio recording rather than the actual soundtrack of the telecast, this album is missing the unused “The Big Dollhouse,” but otherwise it’s a near-complete presentation of the score. It even includes Velma’s “Miss Baltimore Crabs” reprise and a rousing new finale, “Come So Far (Got So Far to Go).” Harvey Fierstein, giving Edna one more go-round, is raspier and lower-voiced than ever, but he pairs nicely with Martin Short on “Timeless to Me.” The new Tracy, Maddie Baillio, is a little tentative on “Good Morning, Baltimore” but soon warms up. There’s luxury casting throughout: Kristin Chenoweth sounds like she’s having a blast as Velma, and while Jennifer Hudson’s physically all wrong for Maybelle, she certainly sings the hell out of “I Know Where I’ve Been.” Garrett Clayton (Link) and Derek Hough (Corny) make little impression, a few choice lyrics are missing, and the tempi of some of the songs could have been sped up a bit. But this is such a big-hearted, happy show that’s it’s nice to have another fine recording of the score, and a few of the tracks — Chenoweth’s and Hudson’s, notably — compare favorably with the originals. — M.M.